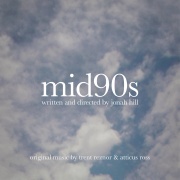 Mid90s (Original Music From The Motion Picture) was composed by Trent Reznor and Atticus Ross for the film of the same name directed by Jonah Hill, released on October 19, 2018. The four tracks composed for the film were condensed into this single EP, while the rest of the soundtrack contains "a collection of decade-appropriate hip-hop and punk songs around which Hill has said he wrote and shot the film." This page was last modified on 2 January 2019, at 23:15. This page has been accessed 1,722 times.